The most anticipated Apple iPhone in years is expected to be unveiled and released as soon as September. 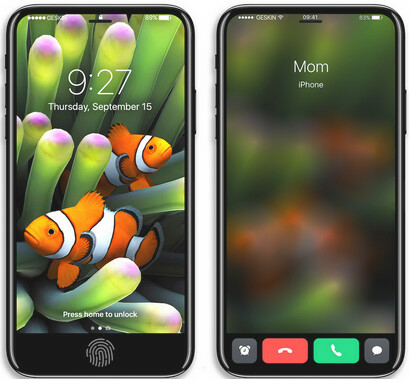 The tenth anniversary model, dubbed the Apple iPhone 8, will reportedly launch with an edge-to-edge OLED display. That would make it the first iPhone to feature an OLED panel. In addition, if the technology allows for it, the Touch ID fingerprint scanner will be embedded under the screen. The Apple A11 chipset will be driving the device, which might be equipped with a 3D sensing front-facing sensor that will allow for face recognition capabilities. A survey taken by Branding Brand, a company that delivers websites and apps for big business, found that 26% of current iPhone owners in the states plan on buying the iPhone 8. 14% will purchase a model from the iPhone 7 series, and 12% plan on picking up an iPhone 6 series handset. 2% said that they plan on switching to an Android powered phone, and 1% expect to buy the Apple iPhone SE. With some of the new features of iOS 11 already revealed at WWDC earlier this week, the same survey revealed that 44% of iPhone users want improvements to the handset's operating system. And a quarter of those responding simply want a new design for Apple's smartphone. The survey lists five reasons why internet users purchase the iPhone. 65% said that they buy an iPhone to make calls. 60% said that they purchase an iPhone to play music, and because it is cool. The percentage of those purchasing the iPhone because it is cool topped the number who buy this particular smartphone to browse the internet, and to send emails and texts (58%). So what are the reasons why internet users don't purchase an iPhone? The top reason has to do with the price of the device. 49% beg off buying an iPhone because it is too expensive. 42% said that they won't buy an iPhone because they don't need another device. 40% of those surveyed won't buy an iPhone because they don't need all of its features and capabilities, and they are happy with their current phone. Lastly, 28% won't pick up an iPhone because they don't want to change carriers. With a price tag rumored to range as high as $1,000, the Apple iPhone 8 is not going to be a purchase made off the cuff. And while the device will draw serious buying interest among the Apple faithful, the company's big task will be to get those who normally support another platform, or those who don't play favorites, to desire the 10th anniversary edition of the iPhone. Can't wait for surface mobile and the iphone 8. Especially the former as i believe they will be revolutionary. I really hope Microsoft will make the Surface mobile something a lot of people want. Perhaps even me. We need more OS competitors in the mobile world. Exactly. Competition is good for business and innovation. I'm really curious to see what msft will offer tbh. I'm prepared to get my mind blown. Precisely. Besides a smaller market share for Android also means less nagging because of their dominant market share at the moment. I would hate to see features crippled because the EU told them so. At work, we're using iPhones and Lumias. Where the Lumias are used for the engineers in the field. And they work like a charm, especially in a Microsoft environment. If there was a 3rd major player in smartphone market, even Android would be better. It might have: 1)Better update system. More devices would get updates and for longer. 2) Google has done great job optimizing Android but if there was a 3rd major player, it'd be even better. Much better background management and less bugs. 3) Support to natively allow firewalls without root. Only vpn method available now. Can't use VPN and firewall or adblock both at the same time. Maybe also Xprivacy without root(just wishful thinking). And many more. If any of those surveys are even close. Then 1% of those wanting an iPhone SE makes sense, especially when we are seeing deals right now of buy an iPhone 7or 7 plus and you will get a free iPhone SE. That tells you right there those tiny cracker box toy iPhone SE's don't sell well. As far as the iPhone 8 is concerned. At a starting price of $1000, then it better come standard with 128 the of storage, and not 32 GB of storage. Especially when we know Apple doesn't have expandable storage. Plus we have already know that it has Samsung's AMOLED displays. We don't know the resolution yet. Not to mention we don't know the camera setup, or if it has the finger print scanner embedded under the display. Does this iPhone 8 have extra sensors to help out with AR like Tango devices. It's already well known that you cannot have any accuracy with just one camera using Apple's ARkit. So we will have to see. You don't know a lot of things but you are sure of the price; don't you think there's a problem with your message? I plan on upgrading to the first phone that I actually think to be an upgrade over my 6s plus. Although I do have high hopes for the iPhone 8 and I am also eagerly awaiting its arrival. If it's good I'll get one 3 months later, by then the prices drop massively here in the UK. When they first come out they're like £70 a month but after 3 months it's down to £40 a month for the same amount of Data and the upfront fee has gone. You're safe getting this phone immediately because you can actually trust Apple products. The problem with the majority of phone manufacturers is that they just simply can't afford to put in the money, or the same amount of money, that companies like Apple and Samsung can. This money is utiliized to ensure an outstanding customer experience from day one. Unfortunately, even Samsung can't measure up to Apple in regard to this, although they do try. But they tried to hard, and ultimately had people's houses blowing up left and right. Very irresponsible. Android manufacturers must realize that Apple is one the rare innovators in the world today. This is why I have no issue dropping however amount of money on great Apple products. They truly are pieces of gold it their own way, and provide you with the best tool on the market to get things done efficiently and creatively. I still remember buying the original iPhone and not knowing how great of a product it is, and having a difficult time dropping that much money on day one. Well guess what - this was one of the best decisions I've ever made. I have been in love with iPhones ever since and will buy an iPhone no matter what. Can't wait to see this beast live in action and destroy...actually obliterate all the competition standing in its path. Android fills with gimmicks. iPhones save lives and make lives easier. These are just facts, so don't you arrogant fanboys come over here all upset that someone is attacking your precious little phone, because nobody wants it. The fact of the matter is that Android owners simply cannot afford iPhones. To be honest, I feel quite bad for them, maybe PhoneArena should open up a donation box. I want everyone to experience the greatness that Apple shares. Too bad sometimes it comes down to affordability. #27 just like Techie, a post riddled with garbage. Spare us the nonsense. he's the Apple flavoured Techie, with much less typos as a bonus. they're equally stupid though. You can actually trust Apple products? HAHAHA! Samsung quality is betetr than Apple quality for sure. Trust Apple products? 62% of them totally failed in just 6 months. Which means, if you woke up and yoru iPhone or iPad still wporks, consider yourself lucky. My brand new iPhone 7+ (Red) on the very first day, after restoring a iCloud backup, completely died. It was about 75% charged out the box. It powered off on its own and no matter what I tried, did not power back on. Since I order through the website and not the store, I had to wait to be overnighted a new phone and start all over. Thank goodness no issues since. I have never lost data on any Android I owned, unless I did something stupid to lose it. I have lost data on iPhone, just doing simple backups that finished, but failed to restore, or had data get erased or not even put back for who knows what reason. Considering I hadn't bought a new iPhone since my iPhone 4S, I was expecting to come to my 7 and be ecstatic about what I may have missed. Only to be disappointed. Seeing that Apple sources for Samsung for the main components, I certainly know I can trust Samsung more than Apple,because Apple doesn't make a damn thing. Apple doesn't innovate. They outsource everything but the phone design and the CPU. Please show me where Apple is innovative? List 5 things Apple created on their own from scratch that they innovated. Please name one part inside the iPhone, Apple manufactured. Oh and to be specific, that part has to be design, engineered and or fabricated by Apple. Not made by another company and apple stamps their name on it. Android filled with gimmicks? Really? So being able to use hardware natively as design is now a gimmick? Samsung phones are th eonly phones with extra features. Gimmicky? Depends on who's talking about them. From your trollign perspective, its not a gimmicky. Its more of a I dont have it so I will blast those who do. Dual cameras are a gimmicky. It doesn't matter if your devices has one gimmick or 5...its filled with gimmicks. Here how about thisALLFANBIYSMATTER: My phonehas dual quads, the highest resolution sand largest didplay in its class, one of the largest batteries, has a headphone jacks, IP68 certification, Iris scanner, face recognition, takes better pictures with 2 cameras vs the iPhone with 3, charges full from zero in 88 mins and not 3 hours, I can attached any file to an email, I can play any type of media format, I can have default apps, 100% customizable, a bigger yet smaller device, a new design every year and so much more...all for less money vs an iPhone which has nothign remotely close. What the f**k are you bragging about. I would never trust ANY CORPORATION>..from the US or not. They are in business to make money. Apple doesn't ive a flying fork about you. Grow up dude! You're stupid! Note 7 had a 200% failure rate. Awesome quality alright. #43 he will say it's not Samsung's fault and it's the stupid users who can't use a phone properly. Go figure. What are you recerring too. Are yku rmtrying ro ring up the Note 7? Sa.sung took full responsibly. Samsung doesnt blame its users, unless evidence says so. 100% of the Note 7 failed. On roughky 60 out of 4M produced. 4M phones is a s.all amount considering 62% of 6 months of sales. You and that fool bith can drop dead. I dint care what phone you like or dont like. You dint have to like what i like. There is nothing to debate because i have the luxury and income to own both. My mom has never bought me a phone. I pay for her phone. Unlike you, i sint dis other phones just because i dont ljke them. I dis them on merit, cost and what looks good or doesnt. Apple is going tonuse the same design yet again on another phone model. The 6,6S,7and 7S. Even though the S6, S7 and S8 look similar, they are nowhere near as identical as the last iPhoneshave been. This is how Apple makes so much money. Becauseyku have to spend money to change a pbone design every single year. Samsung has many faults. But Samsung didnt sue Apple over BS patents. Samsung makes very good products, Apple has goos products made for them. I dont care what you think is better. Stop comparing crap tbat isnt better in enough things to Mtter. The jPhone is better than the S at a few things, but thise things are minor cs the fact that my phone is still better at more things, many of which are important to me. Thus my buying decision. Bjt a ting like some spoiled POS over facts you tuen a blind eye too. Youve ne er seen me defebd Sansung when they were wrong....NEVER. #53 you can tell Techie is pissed and butthurt with his abysmal typing. Can someone read his gibberish? Omg can you check ur typing before posting your nonsense, the same Apple hating nonsense you spew all the time. You don't have to like what phone other ppl like either, but it also doesn't mean you have to diss their choice constantly simply because your a diehard samsung shill. And you don't know what design Apple is gonna use yet for any of their phones this year, as they haven't been released. Also the last several S phones have been very similar. There really isn't much left to change as far as design goes for phones. Not that its a big deal anyway as both the iPhone and Galaxies still sell a lot. Ppl have a right to compare what they think is better just as you have the right. So stop telling ppl to stop comparing something that isn't better in enough things to matter, as it matters to them, as they can generate their own opinion. Obviously millions of ppl think the iPhone is better than any other phone for them cause its what they bought. What you say is better doesn't mean jack, because their opinion is what matters when they buy something. Many of the things ppl buy the iPhone for are important to them just like you said "many of which are important to me". Your opinion isn't the only one that matters or counts. Its not universal, so stop trying to make it that way. Im happy for you that your phone has dual quads, a higher res display, a headphone jack, and all the other crap you listed. But umm I couldn't care less that the iPhone doesn't have dual quads, or a headphone jack, or charges in X amount of time, an iris scanner that id never use. Let me make it clear, I DON'T CARE. Neither does MILLIONS of other ppl, if they wanted all that, they would buy the phone that has that. Not everyone wants the same as you, which you cannot seem to understand. Just because you feel your phone is better, does not mean its true for everyone. Millions of ppl, me being one of them, feel the iPhone is better and so we bought it. You need to understand this and accept it. Its not that big of a deal, and its not your money being spent. Ive tried Galaxy S's, a note, moto razor maxx, HTC, and every time I felt the iPhone suited me better and I finally stuck with it and I'm more than happy with it, which is what matters, and matters way more than dual quads, iris scanners, 4, 6, 8, 16 gigs of ram, etc. Also you say dual cameras are gimmicky right now. I want to see you saying that when the note 8 is released with dual cameras. I'm sure you won't, because in your lil immature mind samsung can do no wrong and everything they release is perfect and the best and has no flaws. Your literally the biggest hypocrite on this site. I personally find your posts pathetic, in the way you bash Apple non stop, and praise samsung nonstop. Never do you talk about any other OEMs, just those 2. Your childish, and really should grow up and act your age. They are just phones. You have absolutely no life. Plasticsh That's what apple said to their customers. #41 neither Samsung do. Oh the irony. Dude, tell your seller to stop giving you rotten Apples from the bad tree. #27 OMFG What a full of s**t post. You don't have a f**king clue what I can and can not afford. You don't know what anyone on this site can and can not afford. If I wanted a iPhone I would buy one. Hell not , I am enjoying the s8+ that I just forked out almost $900 for, so don't tell me I can't afford a f**king iPhone. Oh and to #27 That iPhone is the only phone that has caused someone to die. I'm not going to trade in or upgrade unless the SE is refreshed. Aside from that, I have the SE and the 7. The 7 is nice but I'll rather have the 6s. The 7 is much better than the 6s simply for the battery life, the SE has better battery life than the 6s lol. The same can not be said for the 7 plus vs 6s plus though. Solid point. I realized that (about the battery life on both counts), I was just missing the headphone jack. I hate the dongles but oh well, since I decided to choose this life.